These Banana Oatmeal Chocolate Chip Muffins are going to raise the bar on every sweet breakfast muffin ever baked! They’re one hundred percent natural and loaded with only the most wholesome, delicious, ingredients. 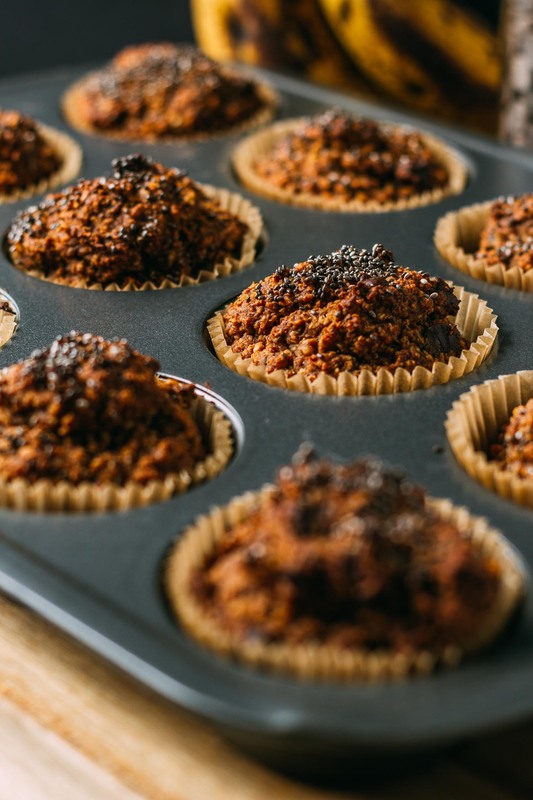 Our muffins get their curiously rich sweetness from plump little nuggets of dates. And, if you like, you can enjoy a gluten-free and plant-based vegan Banana Oatmeal Chocolate Chip Muffins for breakfast; it’s THAT healthy! And the best thing ever is that it’s undeniably tasty; even picky kids love these muffins! Sometimes when we’re testing a recipe, it takes a ton of trial batches before the flavors work. But with these Banana Oatmeal Chocolate Chip Muffins, like out Best Ever Banana Bread recipe, everything came together quickly. From the very first batch, the batter tasted nothing short of divine. But we should give you a fair warning; when mixing this batter, it may magically disappear. Seriously, the uncooked muffins taste so good you may have to stop yourself from “sampling” the bowl until it’s empty. We thought that by the time we tested this recipe a few times we might grow tired of licking the bowl. But, just like our Best Ever Banana Bread recipe, boy, oh boy, were we ever wrong! Here’s a new suggestion for sharing baked goods. Use Banana Oatmeal Chocolate Chip Muffins in place of a love letter. As soon as you share these babies, whoever’s on the receiving end will surely know you love them. These could also be I’m sorry muffins. You know, for those rare occasions when a little make nice, is appropriate. Not that we know anything about that. As always we want to take a moment to share one quick nutritional bit of info for one of the main ingredients in this recipe, oatmeal. 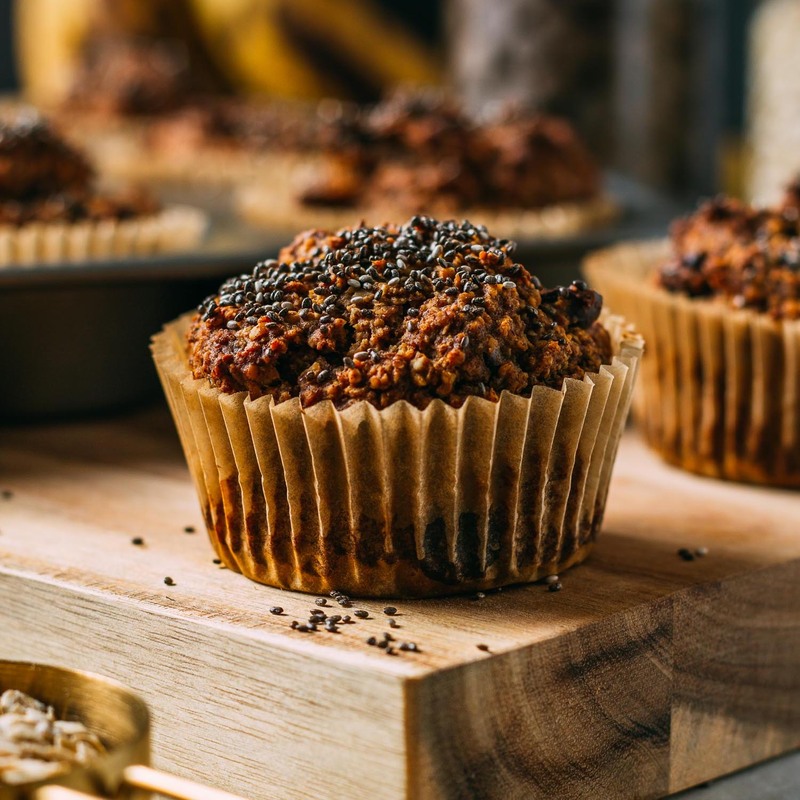 In this recipe for Banana Oatmeal Chocolate Chip Muffins, oatmeal takes the place of traditional flour to eliminate the gluten. And since oatmeal is naturally gluten-free though if gluten is of concern, be sure to use oatmeal that it’s certified as gluten-free. Another benefit of baking with oatmeal flour is the ease of digestion the fiber creates. Oatmeal’s high level of fiber can help lower blood cholesterol level so that less gets stuck in our arteries. In addition to being high in fiber, oatmeal also provides anti-inflammatory properties. And according to Dr. Michael Greger, a plant-based diet that includes whole grains such as oatmeal can reverse the progression of heart disease. Click here to watch his video link on this promising topic. Heart disease is of genuine concern, and we can avoid it or address it through diet. What we eat matters. We recently read that about one-third of the population passes away due to heart disease. all while being wonderfully healthy! 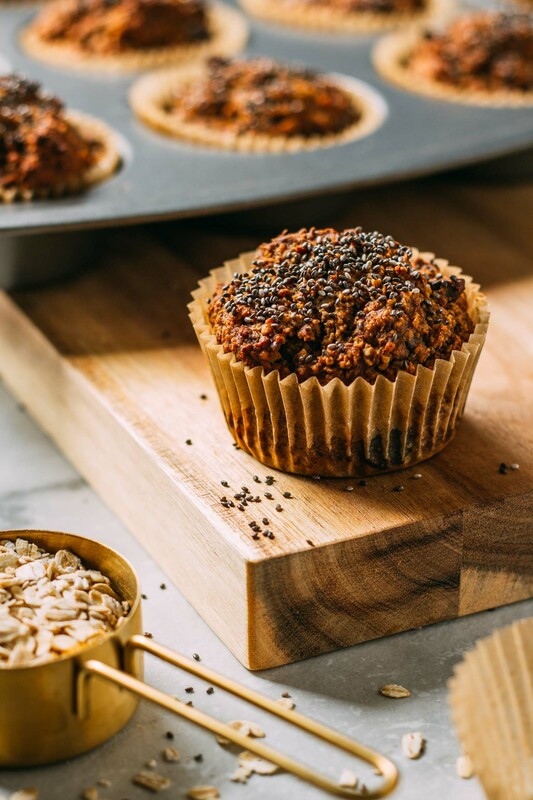 We’re not even kidding about these muffins causing you to feel wonderfully healthy. Maybe it’s because you will know for sure that the muffin you’re enjoying has nothing less than nutritious ingredients. So get ready to be magnificently pleased with what you’ve baked! And one thing we know for sure is this; you’re going to want to repeat this recipe. And you can bet family and friends are going to ask for the recipe too, so Pin it now for safe keeping. 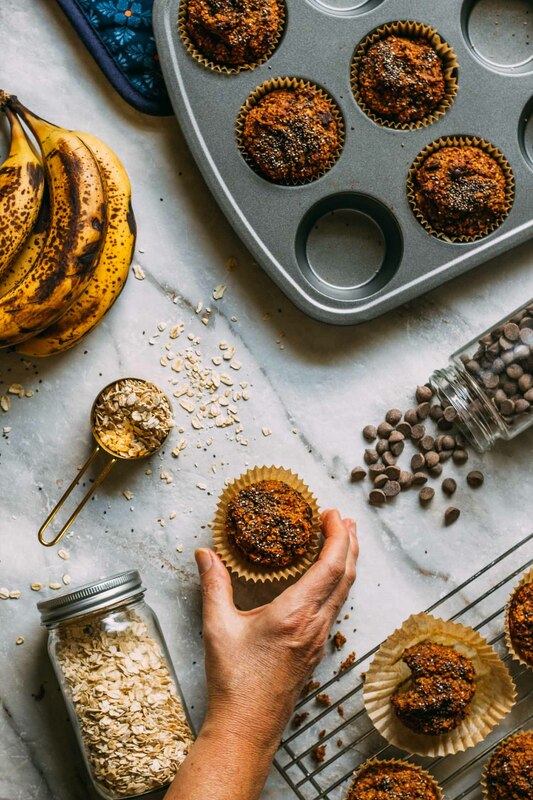 Banana Oatmeal Chocolate Chip Muffins are going to raise the bar on every oil-free breakfast muffin you’ve ever baked! They’re one hundred percent natural and loaded with only the most wholesome, delicious, ingredients. 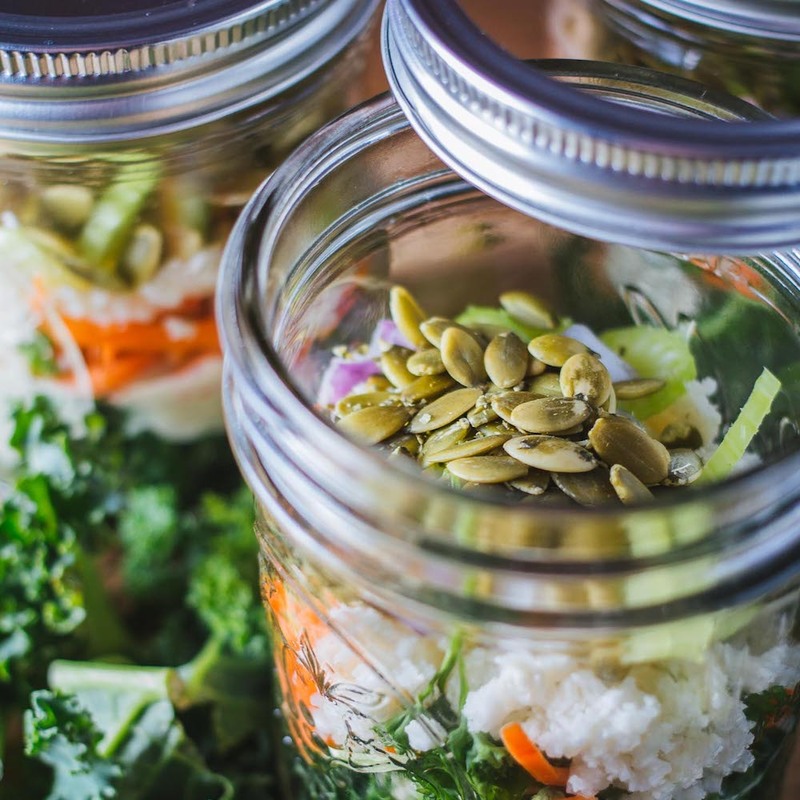 Be sure to check out the nutrients listed below the recipe… these muffins are out of sight! 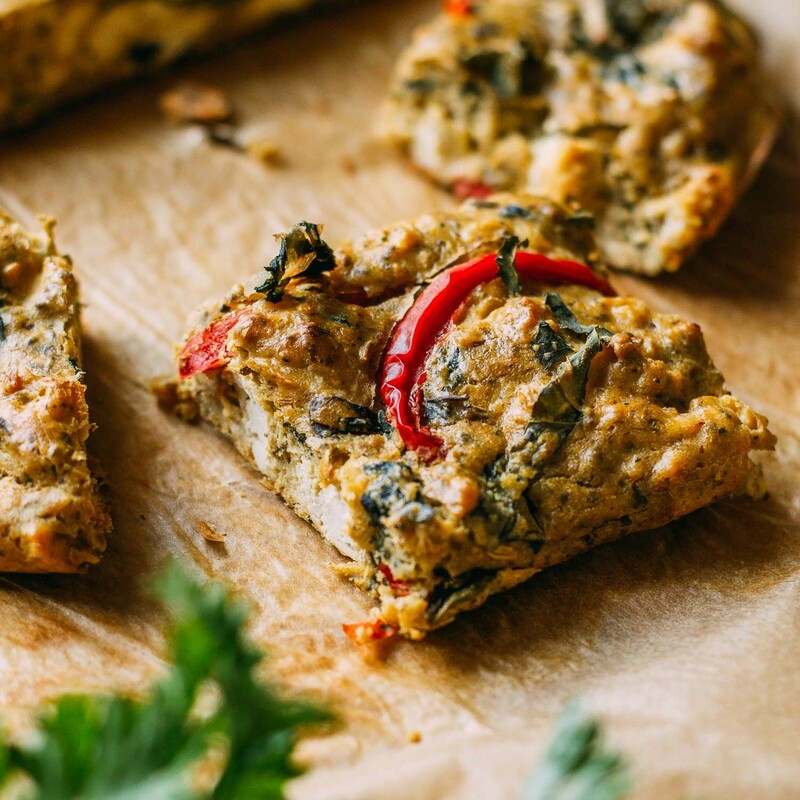 Enjoy these gluten-free and vegan delights for a portion-sized grab and go breakfast or snack with a hot cup of coffee, tea or a tall glass of refreshingly dairy-free milk. This plant-based, oil-free recipe makes about one dozen hearty muffins. 1 tsp of cinnamon - We like this brand and purchase in bulk, three bottles at a time! 1/2 tsp of baking soda - We use this brand because it is certified gluten-free. 1/2 tsp of sea salt or another salt - Since we prefer pink Himalayan sea salt in our recipes, we purchase this brand in bulk! 1 tbsp of chia seeds - plus a bit more for topping! 1 cup of pitted Medjool dates, packed, or about 8 pitted dates - See our note below for money-saving bulk purchase options. 2 tsp of pure vanilla extract . 1/2 cup of mini semi-sweet chocolate chips or cacao nibs - We love this plant-based vegan brand! Preheat the oven to 350°F and line a muffin pan with parchment paper liners. If you don't have parchment paper, you can opt to grease the pan with a light spray of oil. 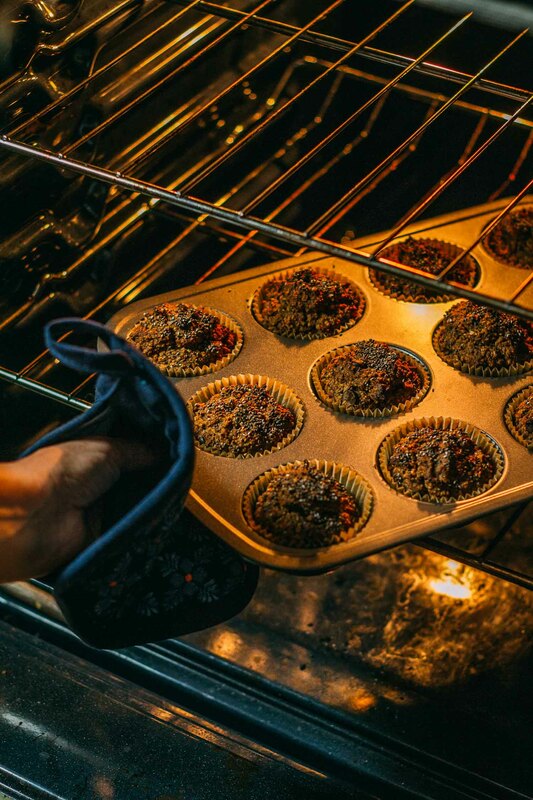 Note that using oil for this purpose means that your muffins will not be refined oil-free. Now, in a large bowl, add the oat flour, baking soda, baking powder, salt, cinnamon, salt, nuts, if using, or old-fashioned oats. Mix these dry ingredients well to combine and set aside. In a food processor, add the dates, almond milk, vanilla extract, and apple cider vinegar. Process the date mixture until it's smooth, like a paste or thick sauce. Next, in a medium-size bowl, mash the banana with a spoon or fork and then stir in the chia seeds and flax egg mixture until well combined. Add the blended dates to the banana, flax, and chia mixture and stir. After that's mixed, add the wet mixture to the dry ingredients mixing just until combined. 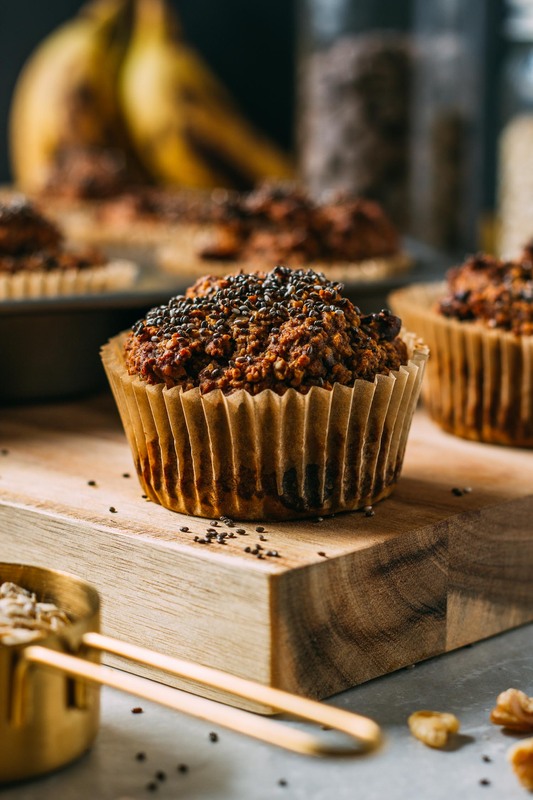 Spoon the batter into the prepared muffin pan lined with parchment paper liners and top each muffin with a sprinkling of the additional chia seeds to add a pleasant little crunch. Bake for about 35 minutes, or until a toothpick or fork comes out reasonably clean. After cooling your muffins completely, store in an airtight lidded container and refrigerating or freezing to retain optimal freshness. Here's a way to always have ripened bananas when you need them for baking. Whenever you have bananas that are ripening sooner than you can eat them, peel and store in an airtight lidded container in the freezer. Banana Oatmeal Chocolate Chip Muffins may be stored in the refrigerator for up to about a week or frozen for months at a time. To prepare this recipe as a loaf instead of muffins, bake in a loaf pan lined with parchment for about 50 to 60 minutes at 350º Farenheight. To save money on the Medjool dates used so often in plant-based vegan cooking, we usually purchase this brand in a six-pound quantity. Since we use dates as the sweetener in almost everything we make, it just makes sense to buy in bulk. It's like getting a pound or two of organic Medjool dates for free! Thank you for asking about where we get our Medjool dates, Angelina. In our recipes, all of the ingredients that are in orange are clickable links that will lead you to Amazon so that the ingredient can be purchased online if you like. 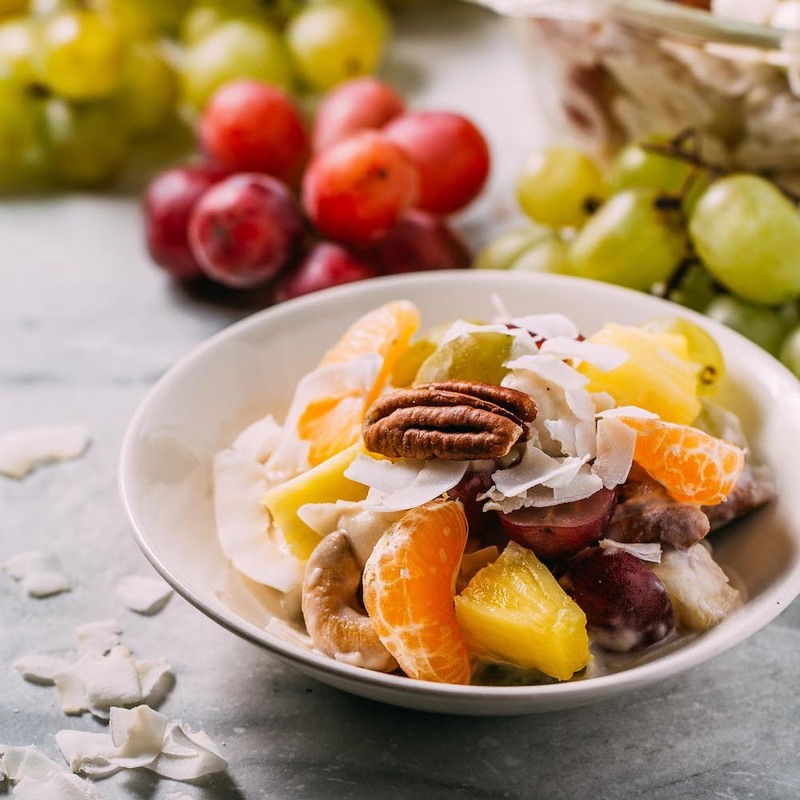 For food items we tend to use a lot of in our cooking, such as dates, we make a special effort to share a link that will lead you to a bulk-buy quantity to save money. I hope that helps. We always try to share the best quality and prices we can find since good tasting ingredients make all of the difference in the way a recipe turns out.